Saint Francis of Assisi is credited for saying, “Preach the gospel always and when necessary use words.” Area residents took this saying to heart this Faith In Action weekend, logging over 500 volunteer hours with the Americus-Sumter Fuller Center for Housing. The event was inspired by Pastor Derek Vreeland of Cornerstone Church in Americus, who last fall preached a series of three sermons on service. On the fourth Sunday he hung up signs on Cornerstone’s door stating that “the church has left the building” to do service projects with The Fuller Center for Housing. As a result, neighbors’ homes were renovated and Cornerstone organized a new local missions committee headed by Jeff McFarland. McFarland and his team are now committed to quarterly service projects with the Fuller Center and other area organizations. This Saturday was one of the service days and they organized volunteers to work on a Fuller Center project on Hampton Street in Americus. And their witness caught the attention of another local church. Dave Landis, a member of Americus Mennonite Fellowship, served as a construction supervisor for the Cornerstone projects and had such a good experience he talked his Mennonite church into having a similar event on Father’s Day. Instead of meeting at their church, 34 people of all ages gathered at the Fuller Center project on Elizabeth Street, and after singing some songs and having a brief devotional they spent the day painting the duplex. “It was exciting to pray and have fellowship in a different way. It is good to step outside our normal comfort zone,” Sanders Thornburg said. Kirk Lyman-Barner who directs the Faith Builder program for The Fuller Center for Housing wants to encourage all of the Fuller Center covenant partners around the country to host Faith In Action Sundays. This year the national Faith In Action Weekend will be on Oct. 10. Some of the goals of Faith In Action Sundays are to change churches from the inside out by helping congregations demonstrate that they do indeed focus on others through mission efforts instead of simply having concern for their own members. Mission work is supported by most congregations, but often it is unseen by their local community. Churches who participate in Faith In Action events have found that the community service Sundays help build relationships with other congregations and community organizations. Volunteering in the community helps congregations reach out to the unchurched, and sharing God’s love in a tangible way. It also can deepen spiritual commitment and church involvement as closeness and unity develops when members work side-by-side helping every person realize they can make a difference! Brother Fredo Jackson, who attends the Good News Ministries church in Americus, will be helping to organize area churches for the “Faith In Action 10-10-10” event in Sumter County. 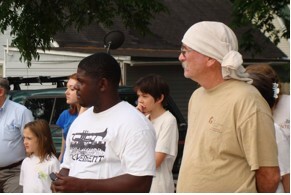 His goal is to engage at least 10 area churches on that weekend to work on 10 Fuller Center projects. Get your own church involved. Find resources for faith groups on our Faith Builders pages! Learn more about the Americus-Sumter Fuller Center for housing here.